The Responsive Evidence Synthesis Service (RESS) is our attempt to co-produce with the Department of Environmental Affairs (DEA) and the Department of Planning, Monitoring, and Evaluations (DPME). It serves as a structured effort to deliver rapid products to decision-makers – evidence products that are both timely to policy agendas while remaining transparent and systematic. Further, the project is rooted in our desire to share in capacity building by offering this service in-house. While this type of rapid response service is common in the healthcare field, it is certainly an early strategy to promote evidence-use in the environmental sector. Thus, the intentions behind the scoping review was to gather evidence in an effort to build an evidence synthesis service in South Africa. Given that this project is fairly unique in being a service from an LMIC and a service in the environmental sector, we were curious to explore current models being used internationally and seeing if there were insights that may be translated into the environmental field. In particular, we were curious to investigate methodological differences ensuing in rapid products produced, operational considerations, along with programme experience with end-users. It is remarkable seeing the initial ideas for the scoping review expand in so many ways. In retrospective, I am grateful for the profound role this internship has had in bridging my perspective on environmental sciences with the medical sciences. As a medical student, we become utterly engrossed with health at the patient level. It is our priority to diagnose and treat the individual for health issues, often causing us to lose sight of surrounding concerns. This internship has sensitized me to consider health beyond the scope of the individual and of society. In theory, environmentalists are just as much practitioners of health as physicians; but in the context of our ecosystem and the well-being of our planet! On a cultural level, coming to Johannesburg, I was pleasantly surprised to encounter a city of vibrant sights, exotic scents, and buzzing music. Wherever I explored, I found myself intimately exposed to the country’s complicated history intertwined with its renewed outlook towards equality. It was humbling to discover such tenacity and grit in a society still tense from events in recent memory. The values behind the work in developing a rapid response service are a testament to South Africa’s growing priority to move forward. I am delighted to have been able to contribute a small part in reaffirming this culture of transparent, evidence-based policy decisions. Steven Chen is a Queen Elizabeth Scholar in Health Systems Strengthening from McMaster University’s Health Forum. Steven completed his research internship at ACE from May-August 2018. He is currently an MD Candidate at the University of Toronto’s School of Medicine. The Collaboration for Environmental Evidence, Johannesburg (CEEJ) centre has been lucky enough to attend to evidence conferences in 2018. The first was the annual Collaboration for Environmental Evidence conference, hosted this year by the French centre, the Foundation for Research on Biodiversity in Paris from 16-20 April. The conference – entitled ‘From knowledge to action: synthesising environmental evidence to inform decisions’ – was focussed specifically on evidence synthesis in the environmental sector. The CEEJ team delivered three presentations. The first was on findings of an evidence map produced in collaboration with colleagues at the Africa Centre for Evidence on ecosystem services for poverty alleviation, while the second presentation focussed on the role of qualitative evidence synthesis in the environmental sector. The final input from the CEEJ team was to co-host a session with Dr Alexandra Collins based at the Imperial College London on rapid response services. Here, the team shared our experience of piloting a responsive evidence synthesis with decision-makers in South Africa. We also detailed here our plans in developing this offering into a full service for the Department for Environmental Affairs in South Africa. The second conference the CEEJ team has attended this year is Evidence 2018. Much broader in its sectorial and subject focus, CEEJ again presented our learning from doing a pilot rapid response for provincial decision-makers in South Africa, as well as some findings from the scoping review done by our first 2018 intern, Steven Chen of McMaster University. We expanded on the progress made against our plan to co-develop our experience into a full responsive evidence synthesis service. It was also here at Evidence 2018 where CEEJ networked with others interested in environmental evidence by inviting colleagues from across Africa attending the conference to submit their details to be added to our growing database of experts. We’re still looking to collaborate and grow our database of those interested in environmental evidence in Africa so if you haven’t yet done so, sign up to our database here! We look forward to sharing our journey as we continue down this road: who knows where the CEEJ team will be in 2019, and what we’ll be presenting on then? Stay in touch to find out! By Likhwa Ncube, part-time researcher at CEE Joburg, hosted by the Africa Centre for Evidence (ACE). Evidence mapping training hosted by the Africa Centre for Evidence (ACE) at the University of Johannesburg on 22-24 August 2018. 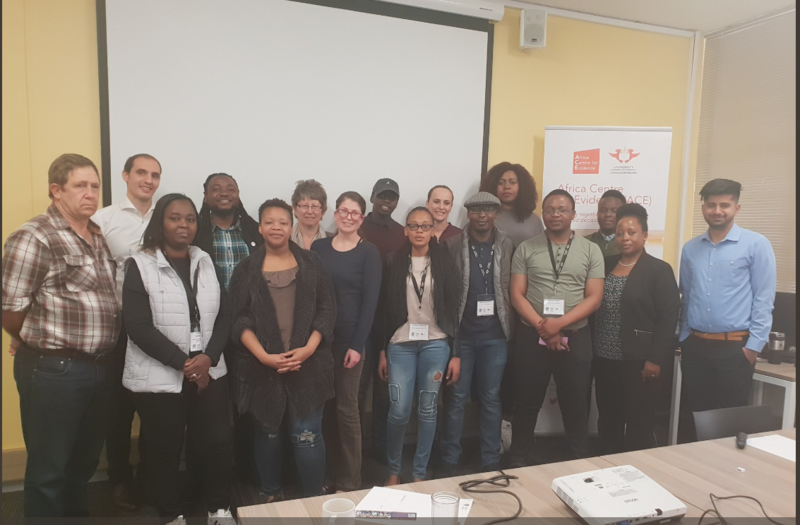 Recently, I attended a three-day evidence mapping training workshop run by the Africa Centre for Evidence (ACE) at the University of Johannesburg. Evidence mapping is increasingly attracting a lot of attention in the area of evidence-informed decision-making as a research method that provides thematic collections of evidence structured around a framework which schematically represents the types of interventions and outcomes of relevance to a particular sector (Snilstveit et al, 2015). Below, I share things that learned about the use of evidence mapping for decision-making. It turns out that evidence maps are a very common part of our daily lives, or at least the underlying principles of evidence maps are. We compare different types of evidence against each other and choose action or inaction based on the evidence we’ve gathered. For example, before placing a best on who will win the English Premier League soccer games, most sensible people first compare different forms of evidence to justify a decision on which team to bet for. We consider the form of the players of the team that we want to bet on, the opposing team, which players are is injured, which players are on a yellow card, and whether the team we want to bet on is playing on home ground or away. These principles of reviewing and consolidating different types of evidence are no different to developing evidence maps for the policy or practice arena. Drawing from the betting example above, combining results from many different pieces of research evidence supports and informs decisions in a better way than decisions based on a single piece of research evidence: the process of grouping together various pieces of research evidence is called evidence synthesis. And evidence maps are a powerful tool to support evidence synthesis. The weighing and grouping together of evidence underlies the methodology behind evidence maps, which enhance the accessibility of vast amounts of evidence in how they visually represent the evidence using bubbles and donuts, for example. Intuitively, the idea of a map for me was very far removed from bubbles and donuts. My background in maps was informed by maps and map reading from high school geography. In attending this training workshop, I was very excited to see how the idea of evidence fits into my pre-knowledge of maps from geography. I quickly realised that in as much as we were using the same word “maps” my geography background was not going to be that helpful here. On the first day, the facilitator introduced the steps involved in creating an evidence map. The first and arguably the most important step stuck with me the most. We were told that when creating your evidence map, clarifying the research question and its scope comes first. A grip of the research problem, its parameters, what the question seeks to answer, its importance, relevance and limitations sets the evidence map creation-process into motion. This for me was clue number one that I had to lose my high school geography background. I found the language of coding and its application to the creation of evidence maps daunting and technical. On the data extraction step we ran the process on a review software with in-built mapping capability: EPPI-Reviewer 4. This crucial step, if not done properly, might prove challenging to comprehend and to master all the intricate processes involved. I recommend familiarizing yourself with the EPPI-Reviewer 4 software first for this step. And no – codes here don’t relate to the latitude or longitude of a specific map location. Just in case you were wondering. Geography maps and evidence maps answer fundamentally different questions. Typical types of research questions that evidence maps inform and/or answer: what works? How x works? What research exists about x? And the application of technology is central in responding to these questions in evidence maps. Although both sets of maps can be very useful to guide one where to go. 3. Was the whole process worth the trouble? The technical components for evidence mapping mentioned above must not scare anyone away. I attended the three-day workshop and on day three, I emerged with my group’s completed practice evidence map. A disclaimer on my technical talents – this was my first software-tech engagement. In the fewest words, I am terrible with technology. Despite this, I sat for the workshop, engaged and on the final day, presented a completed practice map. The moral of this: if I can do it, then anyone can. The importance of evidence mapping as a research tool cannot be overstated. Evidence maps play a vital role in the research and decision-making space to support policy-making, to demonstrate research priorities and gaps, and to manage knowledge as a repository of evidence on a subject easily accessible in times of decision-making. I am glad I attended the workshop. I am now handy with a very important researching tool – priceless! 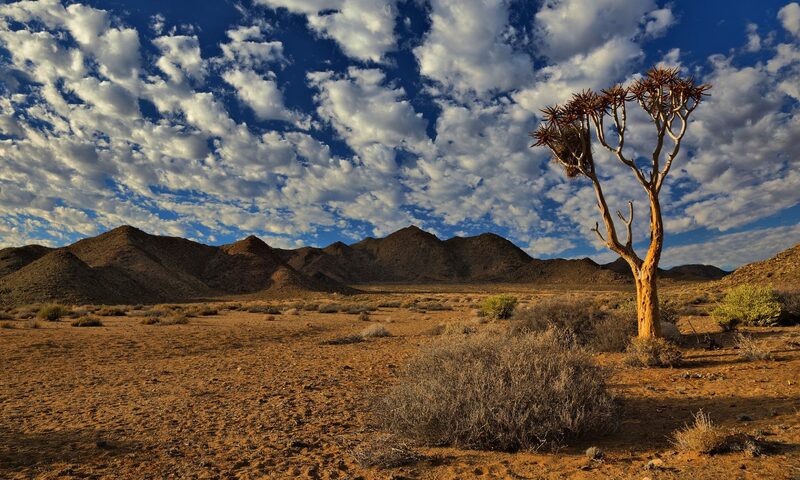 The Collaboration for Environmental Evidence’s Johannesburg Centre (CEE Joburg) was established in April 2012 and arose from the Collaboration’s recognition of the need for a regional centre based in Africa. The main mandate of CEE Joburg is to contribute to the work of the Collaboration by encouraging the need for systematic reviews to inform environmental policy and practice in Africa. As a team of experienced reviewers, CEE Joburg fulfills this mandate by offering training and support to environmental scientists, managers, and practitioners who wish to undertake or use systematic reviews. CEE Joburg is led by Dr Carina van Rooyen, with support from the coordinator Natalie Tannous, and is hosted at the Africa Centre for Evidence under the directorship of Professor Ruth Stewart.